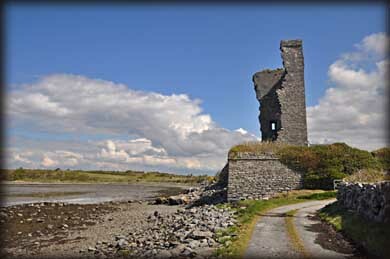 What a treat it was to see this strongly battered late medieval tower house from the roadway with the magnificent views over Pouldoody Bay to parts of Galway county and the hills behind it (see photo below) -- I had to get out of the car instantly to enjoy my walk down to it! 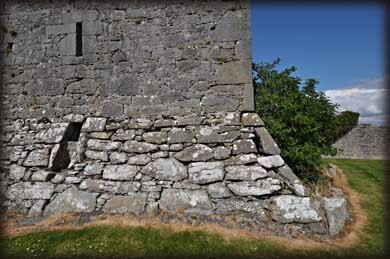 From this angle the castle appeared intact but only this south wall is complete - parts of the east and west wall remain while the coastal north wall has completely fallen into a pile of rubble that prevents exploration of the lower floors on that side (see photo at bottom). 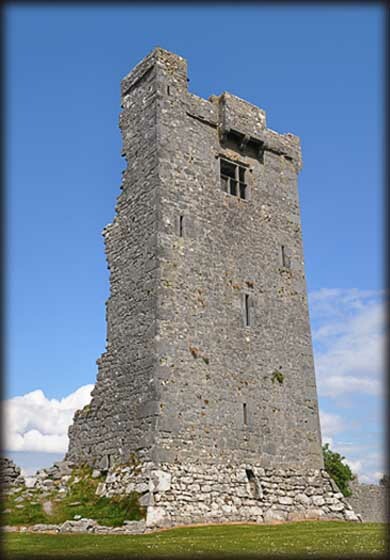 A machicolation juts out from the parapet of the five-storey structure. 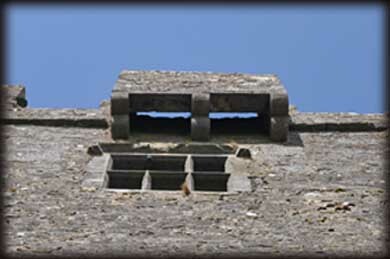 Right below the machicolation is a three-light mullioned window that was likely inserted in the 17th century - all other windows are single narrow slits and most likely original construction. Oddly, the parapet on the east wall projects from the wall with corbels (see photo above) but that construction does not seem to be repeated on the south or west walls (see left). We were unable to find an exact date of original construction. 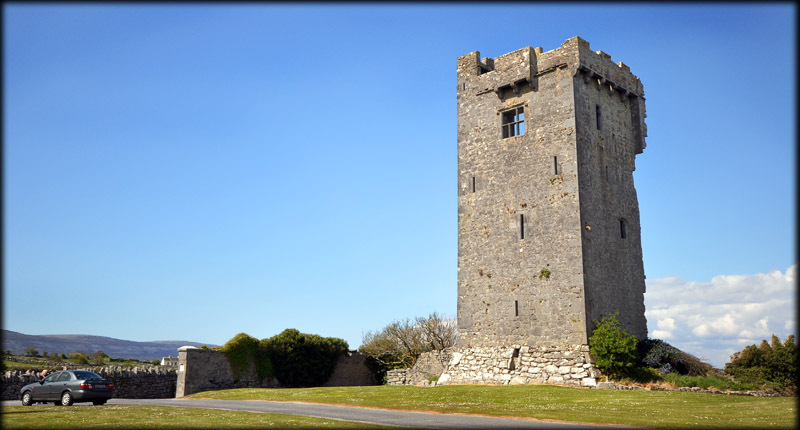 The first mention of this castle is in the Annals of the Four Masters in 1584 as the location where Turlough, the son of Owny, son of Mcloughlin O'Loughlin (owner of the castle) was taken prisoner and later put to death. 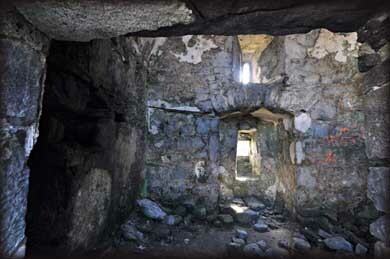 From the shore it is possible to see partially demolished arches and hanging vaults above the first and third floors. It is sad to see huge blocks of masonry in the shore-line rubble which elicits a nearly opposite response than the first delightful approach to the castle. 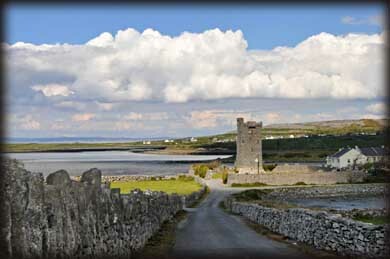 Situated: From Ballyvaughan head north on the R67 for 4.5 kilometres. You will see the castle down a road to your left. Discovery Map 52: M 2622 1039. Last visit April 2012.